The largest porcelain work of art ever created by Lladró of Spain was unveiled at the Wiener Museum of Decorative Arts on January 17th. 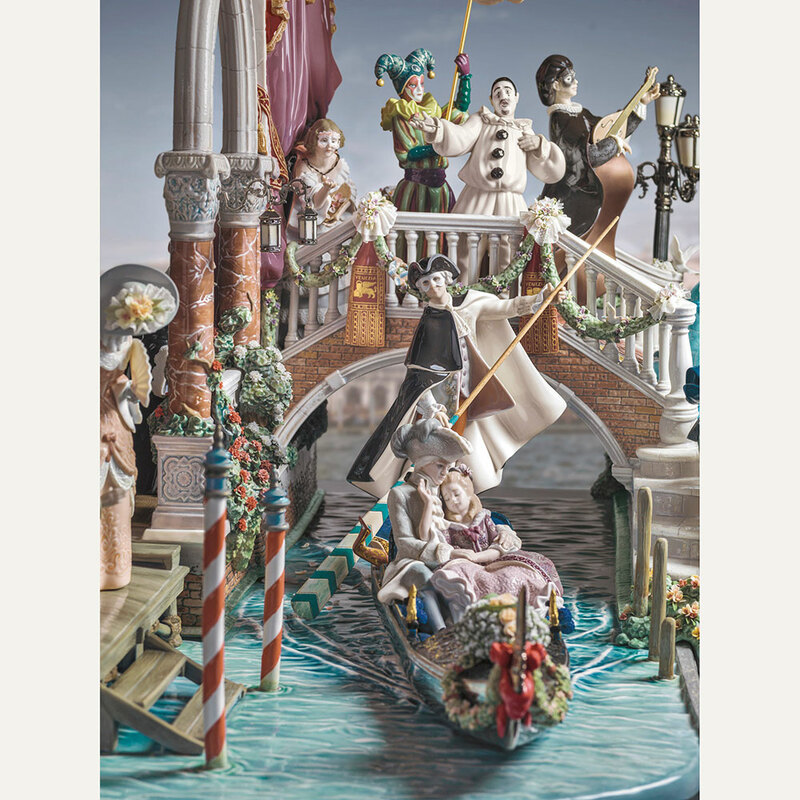 Carnival in Venice is a work of great complexity, almost five feet long and comprising 450 porcelain parts. 35 artists worked over a period of 5 years to produce this monumental work, a milestone in European ceramic art. 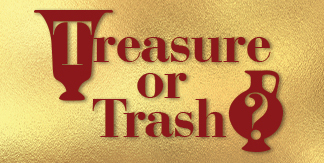 Make your reservations now for the next Carnival & Cabaret event on February 7th. 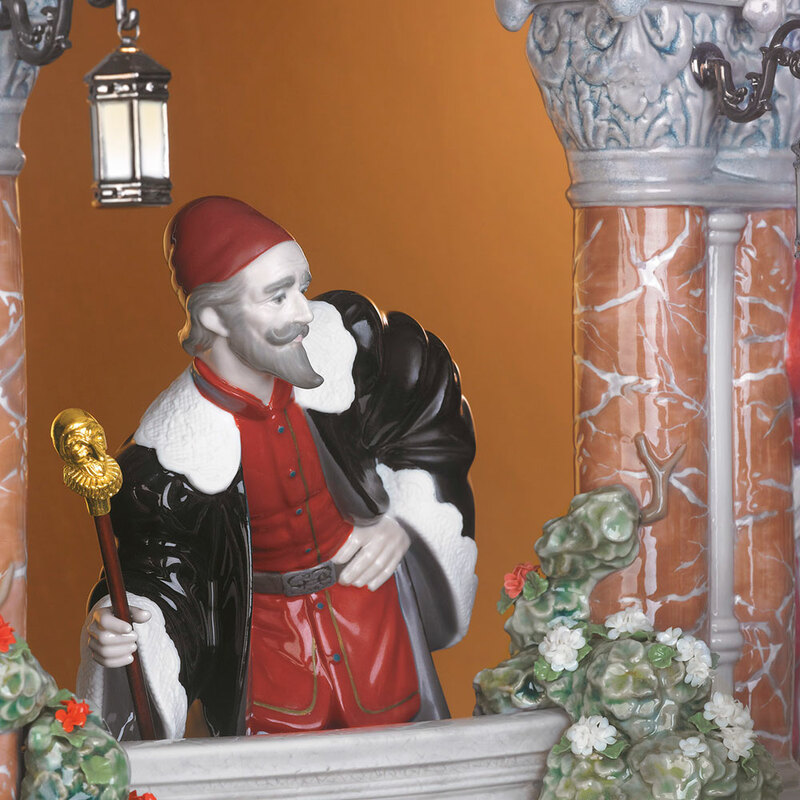 A magical evening during the Venetian Carnival unfolds in the spectacular tableau sculpted by José Santa Eulalia at Lladró. 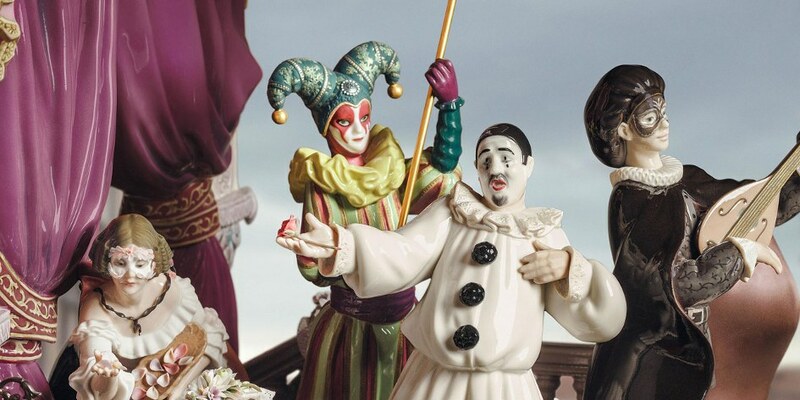 The characters are all familiar from the famous Italian Commedia dell’Arte and wear masks disguising the romantic intrigue and secrets of their situations. Columbine, Harlequin’s muse and mistress, is throwing rose petals at two young lovers in a gondola. They are about to arrive at a masquerade ball being held in the palace of Pantalone, a rich Venetian merchant. Pantalone’s obsession with money left him no time for love but now he misses it and wistfully watches the romantic scene from the palace balcony. Meanwhile his servant Pierrot is hopelessly in love with Columbine and serenades her as he proffers a lover’s rose in a melancholic mime. 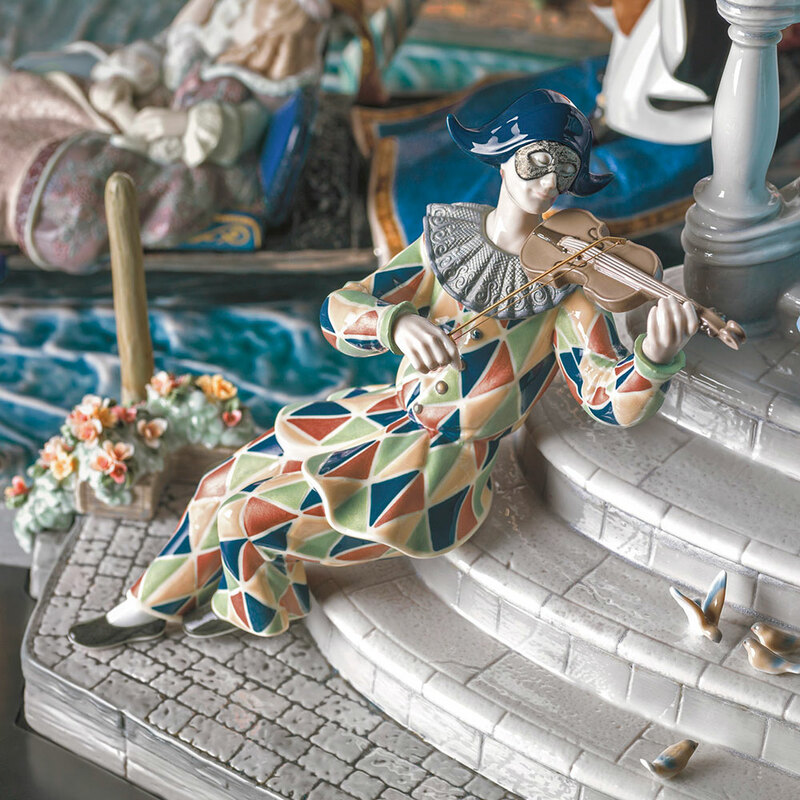 The arrogant, nobly born Scaramouche aspires to seduce the lady of the house and plays captivating music on his mandolin as she descends to greet the gondola. At the side of the canal, another lady glances longingly at the gondolier, her mask concealing their secret love affair. Harlequin and the buffoon in their brilliantly colored costumes add levity to the proceedings. 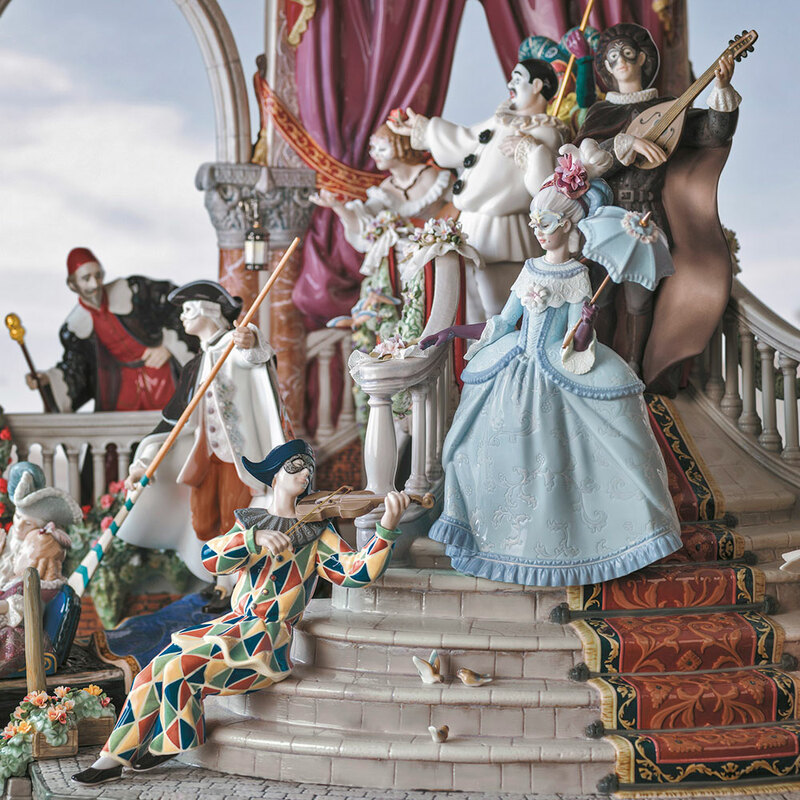 Carnival in Venice is Lladro’s greatest artistic and technical challenge to date. 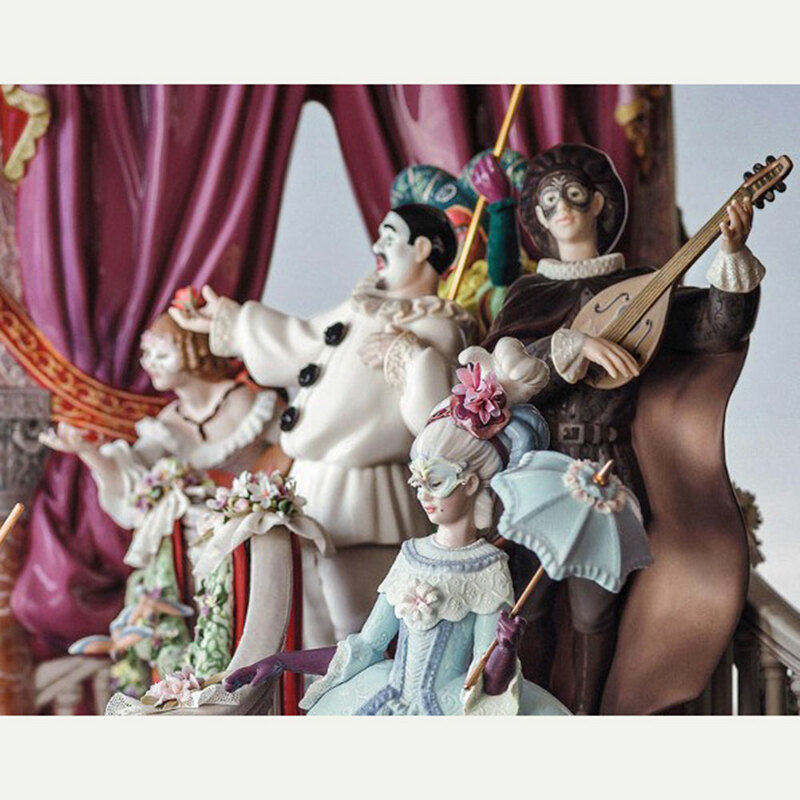 The intricate details in this High Porcelain tableau are astonishing. 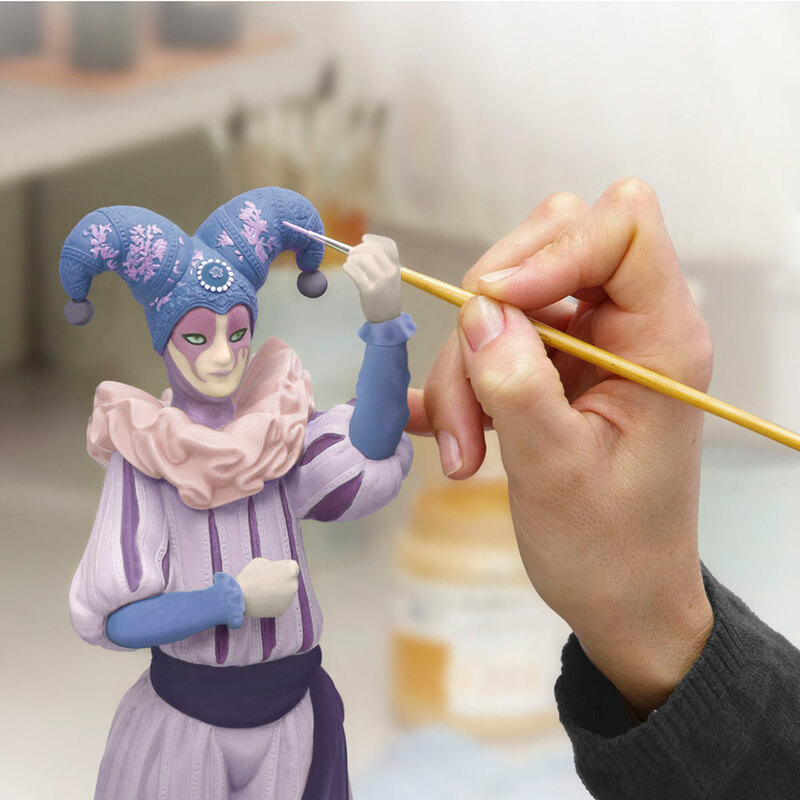 Harlequin’s patched costume is the most complex to decorate as the varied colors are applied in separate phases to prevent mixing. Each tiny petal in the floral bouquets and garlands is made individually by hand and the tulle is produced from very fine porcelain paste which is etched by hand in lacy patterns. The carnival masks are made using similar techniques and are individual to each character in the teeming tableau of the Carnival in Venice.